All of the trim had been sanded pretty well before we refinished the floors, only the shoe molding (that we didn't remove before refinishing) was splashed with stain and poly and left unsanded. I put down some painters tape and got to work. It was going on very nicely, this is just one coat on the right side. 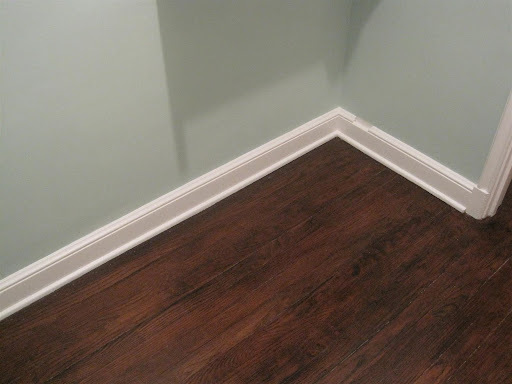 I was impressed with the way it covered the dark oil-based stain and poly in one coat! We didn't fix the notched-out trim yet. It's on the Boozie Fix-List! After two coats, it looked almost as good as the trim that I prepped with B-I-N. And there was no messy clean up! So the bottom line is, for peeling paint and lots of uneven layers, B-I-N is King. For coverup of relatively sound surfaces, even over small amounts of oil-based finishes, the Behr Premium Plus works well! 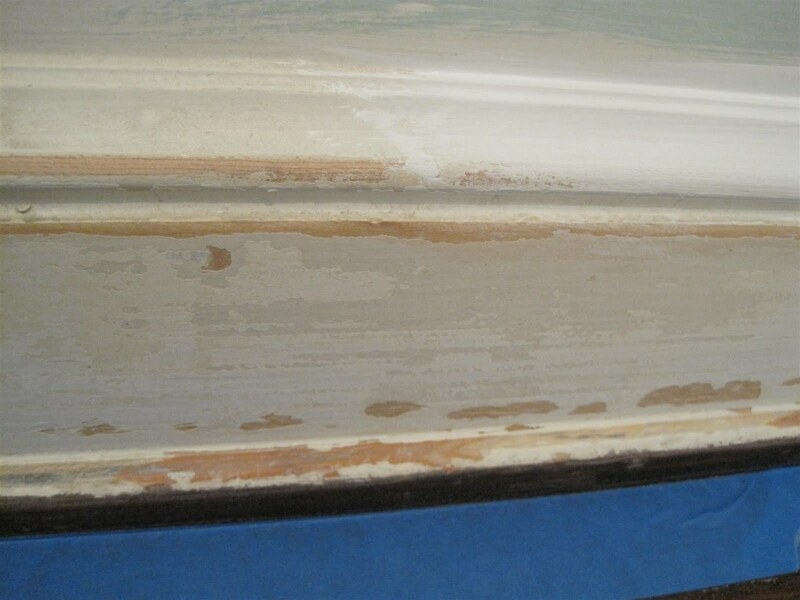 I'm interested to see how it holds up over time, as I also used it on all the door trim without separate primer. I will update on the durability after a few months of use. I sure hope I'm not disappointed! Really? We tried it and weren't impressed. Our issue was painting over bright colored paint and, ultimately, it didn't save us enough work to warrant buying it again. But it HAS seemed to hold up so far. And your base looks great! Good to know! I've wondered about it but have yet to try it. I look forward to your follow up report. I'm really fascinated by these new paints. I used the new Glidden premium paint (with "primer" in it) and didn't like it...it was watery and didin't cover well. Good to know Behr might have the right formula going. I tried the Kilz brand a couple of years ago on a wood desk & it has not held up well at all. But I painted the exterior of my house with Valspar Duramax & it's doing great so far. It was definitely on the thick side & covered great with just one coat. Can I ask what color you used? It looks beautiful against the dark floors & the blue walls. Thanks for the honest review. I've been skeptical of their claims, but it's good to know that it may be right for some jobs. Thanks! I too have used Killz for a long time, and have had to do several coats sometimes. Next time, instead of going with the cheap stuff, I'll try the oil based, and see if I can get similar results. Kelly - I don't think I would use this stuff on walls where I needed to cover bright or dark paint, it's too expensive and doesn't go 'farther' than regular Behr. 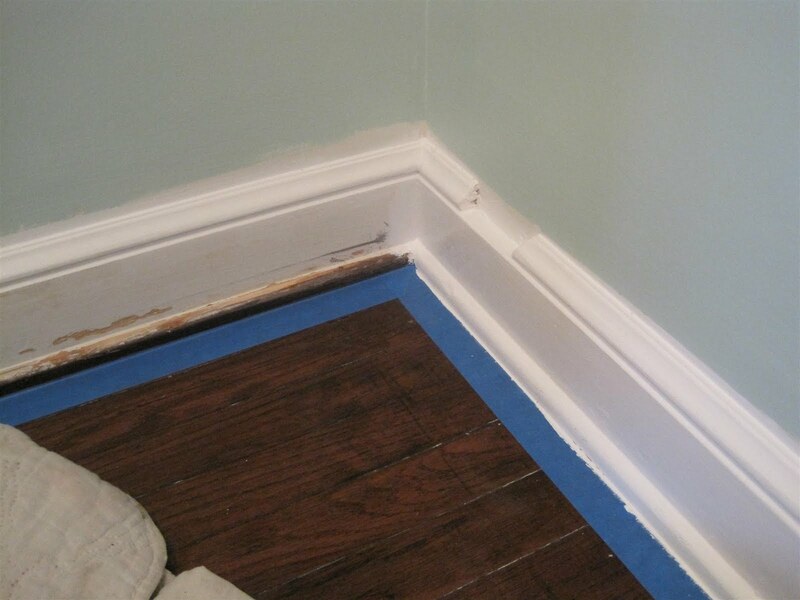 This product gives 'grip' like primer, which is why I like it for the baseboards. Jeannine - this product is definitely not thin...give it a shot! Kate - all the doors and trim in our house is Behr Ultra Pure White (the untinted base). It's a warmer white, and so easy to just grab off the shelf and go. Eric - I don't usually use any oil-base paints, but I do use oil-base primers once in awhile. We have peeling latex all over our house beause the layer under that was oil. BIN primer takes care of all that peeling, but the Behr Premium Plus works well on areas where there wasn't any peeling - without using separate primer. I'm quite happy with it! We used Behr Premium Plus for our master bedroom in Silver Sage and we are so happy with the result. The room hadn't been painted in over a decade and the new paint went on thick, quick, and smooth. Yes, we were more experienced with painting by the time we did this room, but we both agree that it was the fastest and best paint job we've ever done. I love the colors selection, too. p.s. Glad you answered that for someone else (the Ultra Pure White) -- I was thinking the same thing! Very nice color, I've used it in the past. So funny because I was only today bitterly recounting my experience with this product as I was contemplating painting our new place. I hated it. It took coat after coat to cover a dark color. It was splotchy and patchy. And each layer had a tacky dry-down. It pretty much turned me off from Behr products in general. Glad to know that it at least has some worthwhile applications. I have never tried this paint, but with every positive post I read about it, I am getting more and more curious! I just picked up a litre of that primer/paint for my office chair. Thought it would save me one coat!! So fresh & so cl-cl-clean! LMAO @ "Boozie Fix-It List". OMG. You crack me up to no end. Our painters useed Behr Premium Plus on our house exterior (over wood-stained siding) & they raved about it. It's stood up to the elements so far (9 mo. & counting). We've used Behr's paint and primer in one on our living room walls, kitchen walls, and armoire, and only had to paint one coat for everything. It covered everything fabulously and has held up well so far. So awesome to know about BIN! Thank you so much for the tip. I'm totally going to use it when we finally get to those kitchen cabinets. If only we were as quick and professional as you!